Ready-to-use lesson plans for most subject areas and grade levels. Every lesson includes quality learning activities and assessment tools. Thematic units of multidisciplinary lessons. 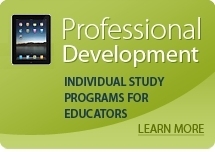 These extended learning opportunities include student and teacher support materials. Interactive student modules targeting specific topics and skills. Use these multimedia tools individually or to supplement lesson and unit plans. A collection of articles, tutorials, presentations, and online books to help teachers improve classroom instruction and student assessment.